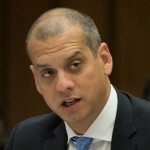 Ambassador Daniel A. Sepulveda serves as Deputy Assistant Secretary of State and U.S. Coordinator for International Communications and Information Policy in the State Department’s Bureau of Economic and Business Affairs (EB). In this role, Ambassador Sepulveda leads and coordinates the Department’s positions on communications and information policy issues. Prior to joining the State Department in 2013, Ambassador Sepulveda served as a Senior Advisor to Senator William “Mo” Cowan of Massachusetts. From 2009 to 2012, he served as a Senior Advisor and member of Senator John Kerry’s senior management team, handling the Senator’s extensive commerce, trade, and business portfolio, which included his work as chairman of the Commerce Subcommittee on Communications, Technology, and the Internet. Ambassador Sepulveda served as an Assistant U.S. Trade Representative leading a team that managed relations with Congress for U.S. Trade Representative Ron Kirk from 2008-2009. He managed trade, immigration, interstate commerce, labor, and ethics and lobbying reform issues for Senator Barack Obama from 2004-2008, and helped advise his campaign for President. He assisted Senator Obama on the Senate floor during the debate on CAFTA, the immigration debates, and during the debates on ethics and lobbying. He also assisted him on labor issues as part of the Senator’s responsibilities on the HELP Committee. In the four years before joining Senator Obama’s office, Ambassador Sepulveda worked for Senator Barbara Boxer, a member of the Senate Commerce Committee, advising her on trade, technology, telecommunications, media regulation, and consumer affairs. He also advised her on immigration and labor issues. Additional prior work experience includes service in the Clinton Administration in the Office of Policy at the U.S. Department of Labor and advocacy at the nation’s largest Latino organization, the National Council of La Raza (NCLR). Ambassador Sepulveda received a Master of Public Affairs from the LBJ School of Public Affairs at the University of Texas at Austin as a Woodrow Wilson Fellow in Public Policy and International Affairs. He received a Bachelor of Arts in Political Science and History from Emory University.